If you want to leave the house, but still want to take your favourite coffee beside you, go get a travel mugs. 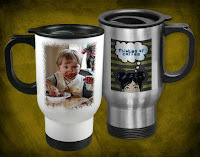 There are many kinds of travel mugs, . I prefer the thumb slide lid. It is easy, spills are unlikely and it keeps the heat in my stainless steel, vacuum mug. Plastic dollar store travel mug varieties, which dont keep the coffee warm. Thermal stainless steel travel mug varieties. Some travel mugs have handles, some do not. Some fit into your car cup holder, others do not. Travel mugs also can have a bright polycarb (plastic) outside in a rainbow of colors. You can even design your own logo and get custom coffee travel mugs made. Some hold enough for one cup and others can handle two or more. Anyone can put anything on a coffee mug! Decorate your mug with photos of your special loved ones, logos, slogan of organizations and teams you support or a funny message poking fun at your coffee addiction.! Its so interesting, you can make your own cup, can make your personality known. Custom printed cups are a great way to promote your business, organization or event! Once I came to my bestfriend wedding, when I write down the guestbook, a girl give me a souvenir. Its unique, it’s a mug and a photo of both of them, side by side in a beach. What a great moment, trully make me jealous. Espresso cups are the cute, its mini, tiny little bundles of cuteness. They hold about one to two ounces of espresso. Big tip to a great-tasting cup of espresso is to warm the espresso cup first. Many espresso machines have warmers built-in on the top. I have one espresso machine, which has a dome to keep the espresso cups hot. Most espresso cup shapes are similar. It is just the materials which are different in their construction. It is generally cylindrical shaped, so it gives an even whole flavor and keeps the heat regular. It also allows you to see the crema in its finest form. The stainless steel espresso cups keep the heat in perfectly. They are easy to clean and are well worth the investment. Porcelain espresso cups look pretty and elitist, but they really dont keep the heat in. You need a thick walled cup to get the benefit. If the espresso cups and saucers are laden with coffee glommage stains you can do many things to get them to sparkle again. The best thing to do is to soak it in Polident, makes the cups sparkle like new. 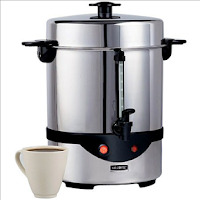 A coffee urn is a coffee maker which can make enough coffee to feed a group people (more then 25 persons). You always see them at bazzar, church socials activity, office and other places. You must serve it right away because most coffee urn machines are still boiling the water making the coffee taste faulty, sour and burnt. Coffee urns generally are filled with water, a huge strainer-type filter is placed on a pole (pole is hollow and runs from center of the base) at the top. The water heats and is either sucked up the pole or boils over the filter and mixed together (with the filter holding in grounds). Coffee urns can come anywhere from 25 cups to 60 cups. Remember, generally more you make take a long time to brew. Ensure there is an on/off switch on the front of the coffee urn. Some do not have switches at all and the urn itself is so large that getting to the outlet, when it is full of water, can be daunting. out. If you have a hose it may be better to spray the heck out of it. Always put the lid on, most machines will not work without the lid, some older machines will spray everywhere. Coffee urns still require the same amount of coffee. If you are using the small office coffee or restaurant coffee packages ensure you throw in one extra packet. The coffee grounds do not always saturate evenly. The coffee urn is hard to clean and will not fit in an average sink to rinse. Always brew your coffee about ½ an hour before you would like to serve it. It takes a long time and doing it too far ahead of time will burn it and make it taste awful. Millions of coffee mugs everywhere and all seem exceedingly unique and cute. I have loads of coffee mugs at my house. I think we all have an overabundance of coffee mugs. Some people have lots of coffee mugs for collection, sometimes the shape, the color, or the ornament is unique and different from the ordinary coffee mug. You may wonder, where do coffee mugs originate from? Well, ever heard the Beaker People? The Beaker people loved their mugs, so much that they were buried with them as prestige items. So, who were these Beaker People? If youre thinking about the Muppets you are completely off base by thousands of years. It began in Bronze Age Europe, 2500 BC 700 BC. A Beaker burial is a single crouched inhumation, found in a bowl-shaped or bell-shaped mound-type grave, with prestige goods like a highly decorated pot, called a beaker. As, the Bronze Age People began farming, and did not travel like the hunter-gatherers by the preceding Neolithic People, Archaeologists have regionalized the beakers by its distinctive markings, since the same patterns were usually found in proximity to one another. Beakers were characteristically bell-shaped with trendy markings for its era, like rope markings, braided markings and a series of cross-hatching. Other items of prestige buried with the inhumations in a beaker grave include: flint arrowheads, bronze daggers, copper daggers, awls, basket-shaped earrings and discs of gold, barbed and tanged arrowheads, stone bracers, battle axes and shale conical buttons etc. The point is nowadays a coffee mug is something we dont really think of, I think we still have our prestigious favorites, but I would never want to be buried with mine. Coffee carafes maintain hot or cold beverages at the desired temperature longer. 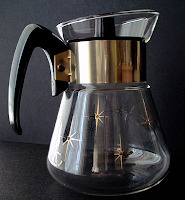 There are thermal carafes and glass carafes, which come with your coffee maker; they are sometimes called coffee pots or thermos, and flasks in the UK, which should be airtight to disallow spills. Then theres coffee carafes, which are insulated and most have a button to squeeze and pour. The benefit to thermos and the latter coffee carafe method is you can decant the coffee right after its brewed and the coffee does not cool right away, nor does the coffee burn. I have experience when I used carafe and I have one major piece of advice. Do not add your cream or milk into the carafe. It is hard to get the sludge out around the top of the inner lip. 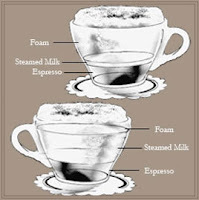 Plus, the cream/milk is heavier and will separate in the coffee carafe. What I do is use a second carafe and put the cream in there to stay cool. Do not take the carafes in the car. Some are not leak-proof and have to be upright at all times. If you are going somewhere take a travel mug or thermos. Get one the size that you will use, and measure it how many cups for a carafe you used to make. The stainless steel is safe for all beverages and for refrigeration. Make sure you have the right make and model before you order a new coffee carafe. Some brands have over 15 models and the carafes may be different sizes. See if you can order two at a time for a reduced cost. Check prices online by clicking the links above. 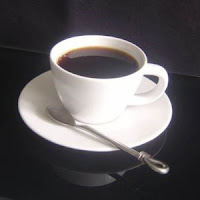 Black Coffee : A drip brew, percolated or French press style coffee served straight, with no milk. Frappe : A big favorite in parts of Europe and Latin America, especially during the summer months. Originally a cold espresso, it has more recently been prepared putting 1-2 teaspoons of instant coffee with sugar, water and ice. The brew is placed in a long glass with ice, and milk if you like, turning it into a big coffee milkshake. Irish Coffee : A hot coffee spiked with Irish whiskey, sugar and topped with whipped cream. An alcoholic beverage that’s best kept clear of the kids, but warms you up plenty on a cold winter night. 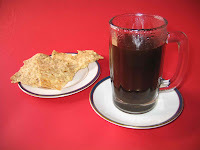 Kopi Tubruk : An Indonesian-style coffee that is very similar to Turkish and Greek in that it’s very thick, but the coarse coffee grounds are actually boiled together with a solid piece of sugar. The islands of Java and Bali tend to drink this brew. 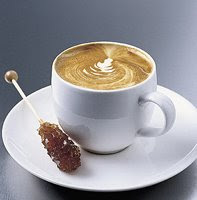 Flavored Coffee : A very much ethnic tradition, syrups, flavorings, and/or spices are added to give the coffee a tinge of something else. Chocolate is the most common additive, either sprinkled on top or added in syrup form, while other favorites include cinnamon, nutmeg, and Italian syrups. Indian (Madras) Filter Coffee : A common brew in the south of India, Indian filter coffee is made from rough ground, dark-roasted coffee Arabica or Peaberry beans. It’s drip-brewed for several hours in a traditional metal coffee filter before being served. The ratio of coffee to milk is usually 3:1. Oliang/Oleng : A stronger version of Thai coffee, Oliang is a blend of coffee and other ingredients such as corn, soy beans, and sesame seeds. Traditionally brewed with a “tung tom kah fe”, or a metal ring with a handle and a muslin-like cloth bag attached. Melya : A coffee mixed with 1 teaspoon of unsweetened powdered cocoa and drizzled honey. Sometimes served with cream. Instant Coffee (or Soluble Coffee) : These grounds have usually been freeze-dried and turned into soluble powder or coffee granules. Basically, instant coffee is for those that prefer speed and convenience over quality. Though some prefer instant coffee to the real thing, there’s just no accounting for taste. This is black strong coffee. It is prepared by pushing with pressure hot water through fine ground coffee. It is thicker than regular drip coffee and served in small cups. The cups are about the size of a shot glass. As a result of the high-pressure brewing process, all of the flavors and chemicals in a typical cup of coffee are concentrated. For this reason, espresso lends itself to becoming the base for other drinks, such as lattes, cappuccini, macchiato and mochas. 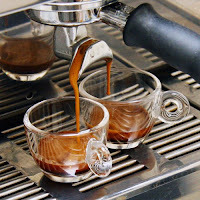 Preparation of espresso requires an espresso machine, whether its manual or modern espresso machine..
You want to grind these espresso beans until they are very fine. Pack the grinds into the group (handle) of the espresso machine. Place your cup/s under the group. If your machine is modern just turned on your espresso machine. And add some hot water. If its manual, pulling down a handle attached to a spring-loaded piston, forcing hot water through the coffee at the requisite pressure. You should see a hazel brown crema appear at the surface of the coffee when its finished. Freshly brewed espresso must be served or mixed into other coffee beverages immediately, or it will begin to degrade due to cooling and oxidation. Temperature and time of consumption are important variables that must be observed to enjoy an ideal espresso; it should be consumed within 2 minutes from when it is served. Now all you have to do is enjoy your Espresso!!! 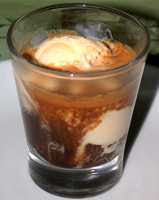 Affogato : Espresso served over gelato. Traditionally vanilla is used, but some coffeehouses or customers use any flavor. 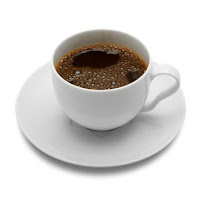 Americano : Espresso and hot water, classically using equal parts each, with the water added to the espresso. 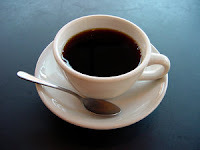 Long Black : Similar to an Americano, but with the order reversed - espresso added to hot water. Black Eye : A cup of drip coffee with two shots of espresso in it. Red Eye : A real caffeine fix, this drink consists of a shot of espresso in a regular-sized coffee cup, which is then filled with drip coffee. Also known as a slingblade, a depth charge, a shot in the dark, an Al Pacino, an autobahn, a "Canadiano", a quantum or a hammerhead. 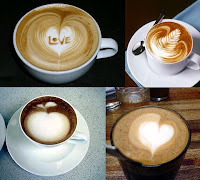 Cappuccino : Traditionally, one-third espresso, one-third steamed milk, and one-third microfoam or milk froth. Sometimes topped (upon request) with a light dusting of cocoa powder/flaked or cinnamon or cardamom. CafÉ CrÈme is the French name for Cappuccino. Dry Cappuccino : espresso with more foam and less steamed milk. Wet Cappuccino : espresso with more steamed milk and less foam. Cafe Breva : A cappuccino made with half and half milk, instead of whole milk. The theory is that the mix gives a richer, creamier flavor. You should be aware, before trying this for yourself, that half and half is much harder to foam. Short Black : this is the standard espresso, 20-25ml of intense, dark coffee capped by a honey-brown layer of crema or coffee cream; it should be rich & full-bodied, not thin or watery [see pic at left]. 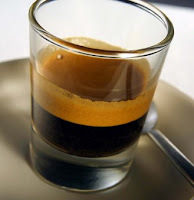 Corretto : Espresso with a dash of an alcoholic beverage, usually grappa or brandy. "Corretto" is also the common Italian word for "spiked (with liquor)". 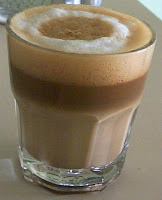 Cortado : Espresso with a small amount of warm milk. Cubano : Sugar is added to the collection container before brewing for a sweet flavor, different than that if the sugar is added after brewing.. Sometimes called "Cafe tinto" or “Cafecito”. Doppio (Double Espresso) : Two shots of espresso extracted to the same length as an espresso (ie around 50-55 mls). This is rocket fuel. Espresso con Panna : Espresso with a dollop of whipped cream on top. Flat White : espresso with hot milk, no froth, very popular in both Australia and New Zealand. Latte : Essentially, a single shot of espresso in steamed milk. The ratio of milk to coffee should be about 3:1, served with either a thin layer of foam or none at all, depending on the shop or customer's. preference. Latte in Italian means ‘milk’. Cafe au Lait : This traditional French drink Similar to Caffe Latte, except that an au lait is made with brewed coffee instead of espresso. Additionally, the ratio of milk to coffee is 1:1, making for a much less intense taste. 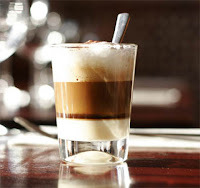 Caffè Macchiato : The Macchiato is an Espresso with a small cap of milk foam on top. Brew the Espresso long so the taste is smooth and not to strong. 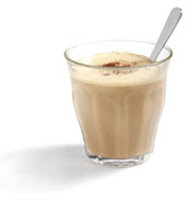 Latte Macchiato : Essentially an inverted cafè latte, with the espresso poured on top of the milk. Macchiato in italian means ‘stained’, it becomes espresso stained by milk. 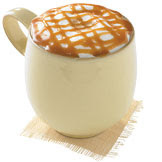 Caramel Macchiato : consisting of vanilla-flavored milk with espresso and caramel drizzled over the top. This highly addictive drink needs nothing else to make it a heavenly java experience. 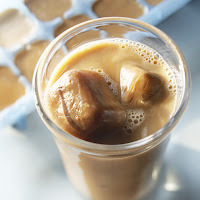 Iced Coffee : It is usually chilled drip coffee serve over ice, with sugar syrup on the side, and sometimes milk so the customer can sweeten the drink to their own taste. In Italy, the Iced Coffee (Caffe Freddo) is pre-sweetened and served ice-cold, but never with ice. In the United States, instead, Iced Coffee is brewed on the spot and poured over ice. Lungo : A 'long pull' espresso. It is an espresso diluted by allowing a longer extraction , The Brewing water is 180-220ml/Cup and coffee about 7-9 g., yielding a weaker taste. Also known as an allongé in French. Ristretto : A 'short pull' (stronger) espresso, .with less water, yielding a stronger taste. The Brewing water is 30-50ml/Cup and coffee about 7-9 g. Also known as Espresso Corto, Café serré or Café court in French. 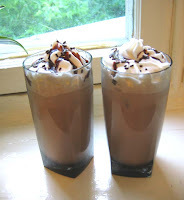 Mocha : Cappuccino or Latte with chocolate syrup added to the mix. Romano : Espresso with a slice of lemon on the side. 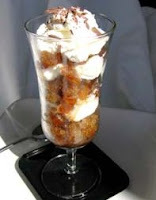 Granita : Frozen espresso, crushed and served in a parfait glass topped with whipped cream. American versions combine espresso, milk & sugar and then freeze the mixture in special dispensing machines. This is also know as a Granita Latte. In Italy, coffee granita is served in tall glasses filled halfway with granita and topped with whipped cream. Granitas are as cool and delicious as ice cream, but they're much light, more refreshing, and a lot easier to make. 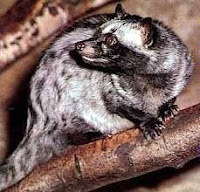 The common palm civet is found in temperate and tropical rain forest from the Himalayas and southern China, to the Philipines, The Malay peninsula, and the Indonesian Island (Sumatra, Jawa, Sulawesi). Its is high adaptive animal and can live in dense forests, agricultural areas, and even alongside humans. Weighing from 4 to 11 pounds, the palm civet’s head and body length is 17 to 28 inches (43.2-71 cm), with tail length of 16 to 26 inches (40.6-66 cm). It ears are small and faintly pointed, as is its nose. Its has a long and slender body with short legs. They have a coarse, shaggy grayish to brown coat with black-tipped guard hairs over all. Three rows of black spot run along each side of its body. The hair around its eyes, cheeks and muzzle is black, with spot of white under each eye and on each side of its nose. The ears, feet and last end of its tail are also black. The markings on its face resemble a raccoon's. Its species name comes from the fact that both sexes have scent glands underneath their tail that resemble testicles. They can spray a noxious secretion from this gland. Common Palm Civet are very fond of palm sap, therefore their common name. The sap is used by natives to make a sweet liquor called “toddy”, which gives the palm civet its other common name. In Indonesia called Luwak, while in Philipines called Alamid. Palm civets forage exclusively at night. The likelihood of encountering predators during the day may have favored nocturnal foraging behavior. Palm civets become active only after dark and retreat to rest sites just before dawn. The common palm civet is primarily frugivorous (mangos, melons, and bananas) but is omnivorous. It feeds mostly on berries, fleshy fruits, and the fruit of Ficus trees. It is picky about the fruit that it eats, picking only ripe fruit. It will also eat birds, rodents and insects as well as fruit. Their favorite foods is the red, ripe coffee cherry. They eat the cherries, bean and all. While the bean is in the little guy’s stomach, it undergoes chemical treatments and fermentation. The bean finishes its journey through the digestive system, and exist, The still-intact beans are collected from the forest floor, and are cleaned, than roasted and ground just like any other coffee. To obtain the beans, they must be collected almost immediately after they are deposited on the ground. 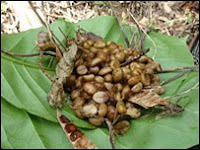 Once they have been exposed to the elements for even a very short period, especially in the rainy season, they break down into individual beans and we can no longer be sure that they are genuine civet coffe (kopi luwak). Other terms to describe it are earthy, mustly and exotic. The body is almost syrupy and it’s very smooth. The resulting coffee is said to be like no other. It has a rich, heavy flavour with hints of caramel or chocolate. Civet coffee just like other coffee, as plump red berries on a coffee tree. For reasons known only to the luwak the cherry is selected especially the red, ripe coffee cherry, and then eaten. Once the cherries have been fermented and digested they come out looking like this! After the civet (luwak) digested the beans were still bond each other so the bean is broken down into individual beans that still retain the parchment. The beans are then laid out on canvas in the sun and dried for approximately 5-7days. Once dry the papery parchment cracks and the coffee beans becomes shrink. The dried coffee beans are grinded or pounded (tradisionally) to make its parchment brittle shattered into small pieces. The parchment has broken down into fragment and dust which is easily removed through winnowing. Some beans still have a fibrous coating because its difficult to remove. That’s way the final step is sorting, a process that is both time consuming and labour intensive.